Some years back I made a startling discovery. I was finding that when presented with the same location, photographers with compact cameras often produced better photographs than those with expensive SLR’s. At first I dismissed this as a fluke but then I started to notice this scenario again and again at all sorts of locations. Now when I say better, it would be easy to dismiss this as being personal preference. Yes there might have been some of this at work but others also seemed to agree. It’s also worth me pointing out that when I say better photographs I am not referring to qualitative such as sharpness of image or colour rendition or noise free images. What I am really talking about is composition which after all is the cornerstone of photography. People with compact cameras were regularly finding better compositions than photographers with more expensive equipment and quite often years of experience. Experienced photographers who often have “superior” equipment can restrict their creativity by thinking the image that would be produced will be of an inferior quality so they don’t try the shot. The less experienced photographer just takes the shot because they like the image and quality is a secondary (if that) consideration. They just want to take a nice photograph. The way you use a small compact camera is very different to the way you use a DSLR. With the compact camera you hold it away from you and view the image on the LCD. This gives you great freedom of movement and you tend to move in towards the subject so that it fills the frame. You also tend to twist and turn the camera easily until you find the most appealing composition. With the DSLR you hold this to your eye which is often held at eye level and further away from the subject. Holding the camera to your eye also steadies it but tends to restrict the movement because it requires you move your head and entire body. I believe this limits the compositions you will try and chances are, prevent you from finding the best one. Back in the “olden days” of film we often used cards with windows cut into them to explore composition but I haven’t seen anyone do this for a long time. If you are a hardened DSLR user you might want to consider using a compact camera as a compositional aid. 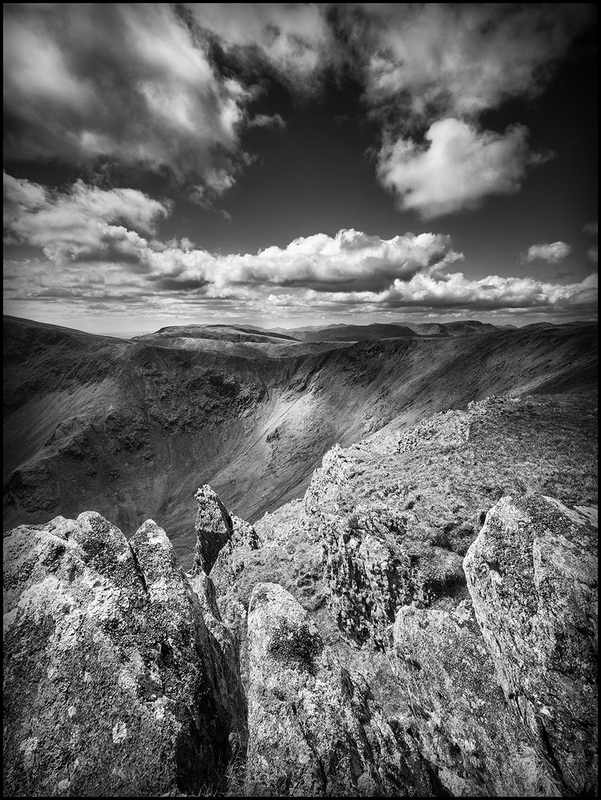 As for the image here, it was shot on my GX1 with an Olympus 9-18 lens and shows the view from the summit of Kidsty Pike in the Lake District. Had I been using a DSLR I doubt I would have moved in quite so close to the foreground rocks and I doubt the image would have had quite so dynamic a composition. I should also have said to click on the image and zoom in. I have posted a slightly larger file than usual. When you view it a full size it gives a greater feeling of depth. I am glad someone else has the same experience as I’ve had: I compose more easily and quickly using a compact camera, be it digital or analogue. Looking through an SLR or DSLR viewfinder is more like trying to compose without a frame in my experience. It’s not like like that for everyone though. But for me the magic is better through a rangefinder’s frame or a compact camera’s eye level finder. The ultimate magic is looking onto the ground-glass of medium or large format camera, which is similar to looking at an LCD screen in that one can use both eyes when composing. I wonder if it is variations in the brain from one photographer to another that makes it easier for some to compose with a reflex finder. I enjoy DSLRs but I have to admit that I take better shots with a rangefinder or compact or even with the EVF on my GX1. And I can’t really explain why. But I’m thinking it’s a psychological reason. Thanks for sharing your thoughts Lars. It’s good to hear that I am not the only person experiencing the “Compact Camera Effect”.